I’m bound and determined to finish The Small House at Allington, book five in the Chronicles of Barsetshire, by Anthony Trollope today. Its interest to me waxes and wanes, at times most achingly slowly. I was thrilled to be invited by Audrey to join her, JoAnn and Lisa in a read along, for my favorite part of blogging these days lies in shared reads. I was also eager to discover Trollope for myself. But, this may be my first and last book of his unless the current feeling I have is suddenly thrust aside in a flash of excitement. 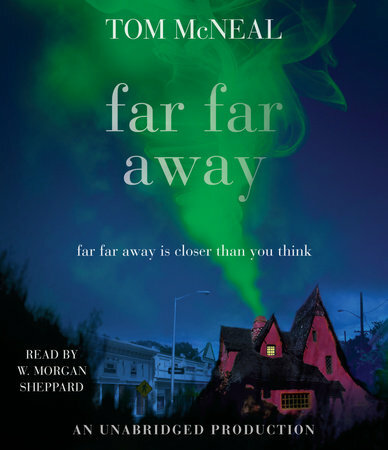 I’m in the mood for something darkly autumnal, actually, and when I received an email from Penguin RandomHouse audio about Far Far Away I had to pursue the trail laid out before me. Incredibly, our library had this version of the novel, and I was spared paying $55.00 for a copy of my own. Which I probably wouldn’t have done without some assurance of its worth beyond the publisher’s promise. ‘A dark, contemporary fairy tale in the tradition of Neil Gaiman. But Jacob can’t protect Jeremy from everything. When coltish, copper-haired Ginger Boultinghouse takes a bite of a cake so delicious it’s rumored to be bewitched, she falls in love with the first person she sees: Jeremy. In any other place, this would be a turn for the better for Jeremy, but not in Never Better, where the Finder of Occasions—whose identity and evil intentions nobody knows—is watching and waiting, waiting and watching. . . And as anyone familiar with the Brothers Grimm know, not all fairy tales have happy endings. So, that is what I’ll be reading/listening to next as the autumn leaves tumble and crunch on the path outside my window, beneath an ever darkening sky pulling us toward October’s end. Are you reading anything wonderfully eerie before German Lit Month begins in November? I have read Barchester Towers. I loved it with its humour and satire. It was also a little bit of a slow read, and as you say it goes back and forth. Once I had finished it, I was happy I had. Great book and such wonderful characters, whether you like them or not. Your comment points to all the good things about Trollope: the characters, and the satire, are indeed wonderful. I think that part of the problem lies in being so slow. (Why did I think that a novel by Trollope would have a faster pace?!) And yet, reading is so often a journey and not a race. It’s getting there that is half the fun, and if I could just slow down my internal unrest I know I would get more out of his writing. Thanks, Lisbeth, for reminding me of that. 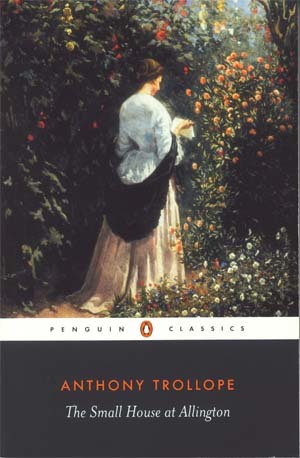 Audrey, it was a happy day for me when you invited me to join you and the others for a Trollope read-along; little did I know that you had been doing it since the first of the year, and that this was already book five! But, I don’t think it was necessary to read the first four, and I am enjoying getting to know the characters you’re already familiar with. They are each one most engaging, and even endearing (especially Lily). I’m glad I was introduced to Anthony Trollope by your invitation. I’d been meaning to read him for quite some time, but never got around to it before now. Trollope can get slow but that’s part of the pleasure too. It gives yiu time to fully get to know the characters. See? That’s the problem: I can’t expect Trollope to move quickly, and once I accept the fact that we are going to move at an intricate, deliberate pace, I’m much more content to wander along. It was good to have these gentle reminders to slow down, to fully learn about the characters and their context. Interesting that this novel had a resurgence in popularity in the 1990’s when the British Prime Minister (John Major) declared it his favorite book. There is something about this time of the year that just lends itself to spooky reads right? I’m reading a ghost story right now too and really enjoying it. Can’t wait to hear your final review on this book – I’m very intrigued! It seems that spooky reads are calling my name! I just reserved The Woman in Black by Susan Hill which has been listed in several places on line, such as flavorwire and the Telegraph, as one of the scariest ghost stories ever. Now I wonder if I have the guts to read such a book! But, I’ll surely try. Far Far Away I’ll listen to as I drove to work, and should I finish it, I’ll certainly review it. “flash of excitement” is not a phrase I would associate with Trollope. Of course I think if the book is any good you should always slow down. Fast reading is for bad books. Of course, “flash of excitement” was an expression of sarcasm. Or, hopeful anticipation. Never did I expect it to be quite such slow going. There are moments of hilarity, though, and they brighten up my steady, plodding pace. As you say, a good book should be read slowly. I take it you like him, especially with 48 posts dedicated to his writing. As for me, I must admit to finding him a bit dull. Interspersed with moments of brilliance, to be sure, but overall tedious. At least for my current frame of mind. Love the quote you found to accompany the adverb. Trollope is second-rate compared to Thackeray or Dickens, but he turns out to be big, big fun to write about. “A leisurely ride”…such a perfect way of saying it. And, as I only have a few pages left, and am preparing to post my final thoughts soon, I can say that I have ultimately enjoyed this novel. Once I fell into his pace, and laid down my own, I found it quite pleasant. Looking forward to Death in Venice with you in November, and before I get too far into Far Far Away, I will be opening Henry James’ The Turn of The Screw. It sounds like a fascinating ghost story which I have never read. I apologize for the sense off it ring a chore which I posted about earlier, for really, as I near the end of the book it has not been that way throughout. I can certainly see how endearing the characters become and how the story builds on their quirks and foibles.